Holy cow is a concept misunderstood by many. There are several reasons for considering cows sacred. One of the most practical is related to motherhood. When the breast-milk of our birth-mother dries up, mother-cow will offer her milk. Thus, throughout the ancient literature of India, the Vedas, we are educated to regard cows as one of the six mothers, besides our birth-mother, who are to be, at all times, loved, protected and worshipped. It is the motherly generosity that makes cows auspicious. They deserve to be treated as respectfully as any other mother. 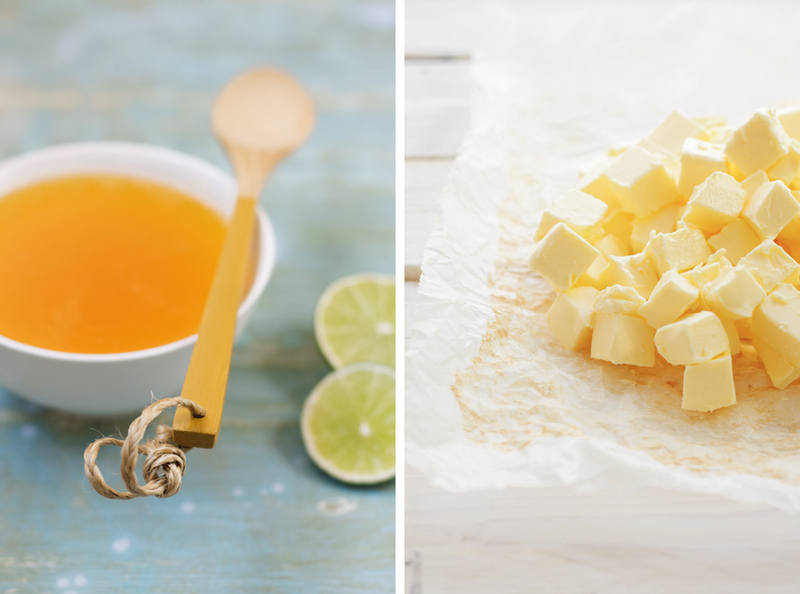 Ghee, clarified butter, has always been an important element of Indian lifestyle. It has a role in religious rituals, offerings and festivals for its purity. It is considered as food for Gods. In cooking, ghee is favoured over any other fat or oil. Its smoke-point where the molecules begin to break down, is well above the temperatures of most vegetable oils, what to speak of butter. During the clarifying process water is simmering off, milk solids and proteins are separating, and froth is filling the surface. When cooked long enough, ghee is finally sieved. Stored in air-tight containers, it remains unspoiled for extended periods without refrigeration. Ghee is the most refined end product of milk. The texture, colour or taste depends on the quality of butter it is made of, as well as the time and temperature of boiling it. Unsalted butter is best for making it. Homemade, fresh butter yields ghee that has a fragrance of caramel. Most common cooking method I use, as you will see repeatedly on the recipes here, requires a spoonful of ghee either at the beginning or the end of the process. Chaunk is a Hindi word for it. It means briefly tempering or sautéing spices (including minced ginger or even sugar) to liberate essential oils and enhance the flavours. It cuts the edge of the spices and makes food more digestible. Ghee helps the absorption of vitamins, minerals and phytonutrients. Because ghee is composed almost entirely of fat, common sense has to be applied. Excessive usage will contribute to obesity. The animal origin of ghee makes even a small amount satisfying to palate. It is rich in Vitamin A and D.
Ghee softens and strengthens, protects and nourishes skin. It is a natural cosmetic with healing and rejuvenating propensities. It increases the overall strength, lustre and beauty of the body. The agitation of mind is soothed by massaging head and feet with ghee. Take any amount of unsalted butter and place it in a heavy bottom sauce-pan. Melt it in a medium heat and bring to boil. It may splutter at this point. Turn down the heat to the lowest possible and let it simmer, uncovered and undisturbed, until the milk-solids will separate. The butter will quickly develop foam at the top and gradually a light brown crust on the bottom. You may carefully shake the pan from time to time to prevent the bottom part from burning. If it burns, ghee is lost. Watch out! Simmering time depends on the amount of butter. More butter, longer it takes. It can take anything from 30 minutes on. Ghee is ready when there is a thin whitish crust on the top, a clear golden layer of butter-oil in the middle and a brownish crust on the bottom. There should be a pleasant aroma. Turn off the heat. Let it stand for a while. Remove any crust from the surface with a spoon. Pour ghee carefully through a sieve, filter or muslin cloth into a clean and dry glass jar. Let it cool completely before closing the lid. Store it at room temperature. You may use the left over milk solids in cooking and baking. They will go bad quickly; utilize them as soon as possible. At room temperature ghee has a fudge like consistency. If refrigerated, it would become a solid block. Always handle ghee with a dry spoon. Dear Kankana, thank you for your encouragement and blessings. Both appreciated and needed. I hope to learn from you in cooking and blogging. Wow, I have always searched for your blog the moment I saw the pictures in flickr...Now this blog made my day...:). This blog is as beautiful as your photos....Serene and Peaceful..
As usual, I'm so much behind...But I'm glad to see you've finally ventured into the blogosphere ! I am delighted! I am delighted! Now I know where the extra hours of my days are going to be spent:) so glad you have started this blog. Soma, welcome back from the holiday! I hope everything went well and you are rejuvenated. So glad and happy to find you here!